The beauty of filet crochet lies in its simplicity and versatility. The art of filet crochet uses the most basic crochet stitches -- chain stitches, slip stitches, single crochet and double crochet stitches -- to create patterns, motifs and silhouettes that rival the finest lace. Even novice crocheters can easily complete simple motifs, such as hearts, daisies and sailboats, in just a few hours. Experienced crochet artists may spend weeks creating landscapes, portraits or complex floral patterns. Regardless of the complexity of the design, a finished filet crochet piece deserves to be hung and displayed properly. Filet crochet patterns show most clearly against a dark background. A filet crochet doily or design makes a classically elegant wall hanging when you mount it on a dark, padded background and frame it under glass. You can purchase filet wall hangings mounted this way, or mount them yourself. Simply remove the backing from a picture frame and cover it with your choice of contrasting color fabric. Lay the crochet piece over the cloth-covered backing and secure it in place by taking a few stitches with a needle and thread. Replace the backing in the picture frame, and hang your piece on the wall or stand it on a table. Create a country or Victorian-style look by stretching smaller filet crochet pieces in a wooden embroidery hoop. Most craft shops carry the hoops in sizes from 3 to 14 inches, as well as oval hoops in varying widths. Embroidery hoops consist of two rings, one slightly larger than the other. The larger hoop closes with a decorative screw clamp. To use one, you loosen the screw and remove the outer hoop, lay the fabric over the inner hoop and replace the outer hoop, tightening the screw to hold the fabric taut. The same tension will maintain the shape of a filet crochet design, and a contrast fabric backing between the filet piece and the inner hoop shows off the delicate work at its best. To hang the hoop in a window, place the filet piece into the hoop without a backing. Needlepointers and cross-stitchers often stretch their canvas on a scroll frame while working on it. They're also ideal for displaying a filet crochet scene or decorative frieze. Manufacturers make scroll frames in many adjustable sizes, so you can easily find one that's just the right size to display a piece of filet crochet. To mount, sew a narrow strip of cloth to two sides of the filet crochet piece. Slip the cloth into the slits in the frame rollers, tighten the rollers and carefully turn them to stretch the filet crochet piece on the frame. Hang the frame on a wall, or purchase a frame with an included stand. 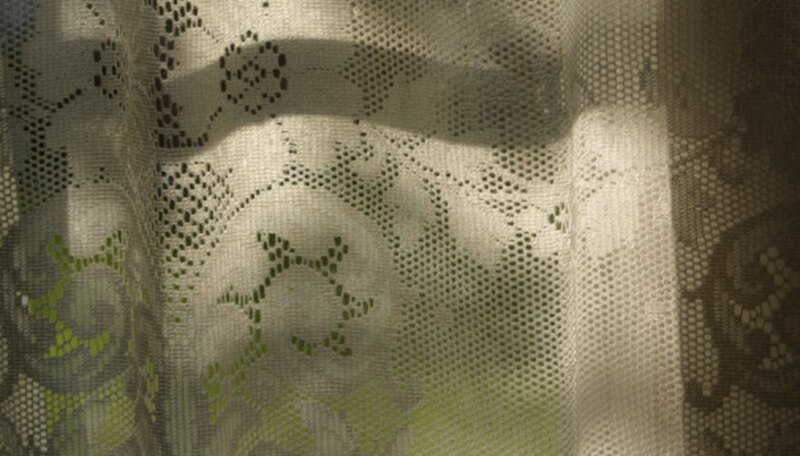 The versatility of filet crochet work makes it a popular choice for crochet window treatments. A repeating pattern of roses or hearts worked in white or pale pink creates a valance for a romantic bedroom, while one of sailboats in marine blue might be the perfect finishing touch for a boy's nursery. Slide a valance rod through open filets, or hand-sew a narrow strip of fabric to the back of the filet piece to form a rod pocket. For a different look, slide one cafe rod through the top of the valance and one through the bottom and mount the rods at the top of the window.